Easily turn ground game meat into delicious patties perfect for grilling – just the thing for an open campfire or outdoor grill on a trip. 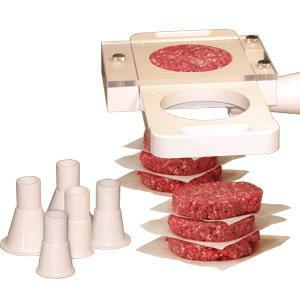 The Automatic Rapid Patty Universal Patty-Forming Attachment is compatible with #8, #22, and #32 series electric meat grinders, so burger making becomes an easy simultaneous process of grinding and patty making. Comes with 5 adapter funnels: 2-1/8" 2-5/8" 2-7/8" 3-5/8" 4-1/2"